Glenn Colliver was the caretaker of Mt. Washington Cemetery at the time of Anastasia's murder. He testified about having seen Anastasia WitbolsFeugen on the afternoon of her murder, having seen her with Justin Bruton later that evening, having spoken to her father the next morning, and having seen police at the murder scene in Lincoln Cemetery later that same day. He testified about the location and boundaries of Mt. Washington,(1) and gave some general information about the William Rockhill Nelson Family Memorial(2). He testified that he had seen a young woman he identified as Anastasia sitting on the steps of the Nelson Memorial(3) in the afternoon. Good morning, Mr. Colliver. Would you tell the jury your name, please. Mr. Colliver, you've warned me that you have some hearing loss; is that correct? Are you hearing me all right now? All right. You're retired now; is that correct? I first become associated there in 1943. By the time you retired, what was your position with Mount Washington Cemetery? I was the general manager there. Fair to say you're pretty familiar with the area surrounding Mount Washington? I'm going to try to orient the jury through you with that area. Would it assist you in describing that area to the jury if we used a map? All right. I showed you before you came in here what I have marked as Exhibit Number 20, did I not? Would it assist you in describing the area in general to the jury by using this map? Your Honor, if I could just have a second. Your Honor, can the witness leave the stand and then stand over here by the map? Absolutely. Counsel is welcome to move and, again, if members of the jury, if you want to stand up or can't see what's going on, tio what you need to do. Mr. Colliver, I want you to remember, while we're talking for the jury, there is a reporter behind you, and she is also trying to got everything you say. If you can't hear, say so. She will. I guarantee you. In this particular map, I'm pointing right here to where it's printed Mount Washington Cemetery? Now, surrounding Mount Washington Cemetery, major roads here, what is this road that's going north and south? That's Interstate 435 which is our western boundary. I'm going to go ahead and highlight -- I'm currently highlighting in this orange color, this 435; is that correct? To the north you've already told me that the internet has our roads in Kansas City wrong, and this is not "Winger" Road; is that correct? In fact, it's "Winner" Road? But the 24 Highway symbol is correct? That's correct, the 24 Highway. 24 Highway, is that what spans the northern border of your cemetery? I'm going to go ahead and highlight that particular area up to the north. To the south of your cemetery is Truman Road; is that correct? And is this Truman Road that goes from 435 on into Independence; is that correct? I'm going to highlight that. Now, what is the road that is the eastern boundary of your cemetery? And that's this road that goes almost straight from Truman to 24; is that correct? I'll highlight that. Now, this main area here that's kind of in the dotted area in our map, that's Mount Washington; is that correct? And it actually goes across here on this map and crosses Blue Ridge Boulevard; is that correct? And a small cemetery located adjacent to Mount Washington, that's Lincoln Cemetery; is that right? I'm going to highlight around Lincoln Cemetery. That's this particular area. It's properly reflected on the map; is that correct? That's correct. This is an unimproved area of the cemetery. No burials west of Blue Ridge. So it's not being used yet? There's room for growth; is that correct? And do you have a growth industry; is that correct? All right. You can have a seat, sir. I'm going to ask you, sir, to think back with me back to October 22nd of 1997. You were still employed at the cemetery then, right? On that particular day, it's not unusual for you to be driving through the cemetery taking care of your tasks? It's the William Rockhill Nelson Family Memorial. Now, that Is a pretty significant spot in your cemetery; is that correct? Could you just describe what that is so the jury will understand what its significance is? Well, it's a rather imposing stone building that sits on a tract, about an acre of ground. It has many steps leading up so far, and then it goes around to each side to make entrances on either side. And banisters on each side of the steps. So a rather attractive building; is that correct? It's a rather attractive building; is that right? Now, the stairs that come from the Nelson actually descend to the street; is that right? Now, is that where you saw this young lady for the first time that day? Is it unusual at all to see people in your cemetery during the day? Nothing really kind of caused you to be suspicious at that time; is that correct? Now, was she just sitting there at the Nelson? Did anything strike you as unique about her? I guess I did look at her because earlier that day we had had several high school girls in there, and I had not seen them, but the local police had rounded them up and taken them out Apparently they were truant maybe from high school or something. So when I came by that late hour and saw her there, I thought perhaps she was one of the leftovers. But on a closer inspection, I could see she was a more mature young lady, and I had I looked at her though. I was close enough, we made eye contact and I smiled and nodded and went on. In terms of location in your cemetery between the northern boundary of 24 Highway and the southern of Truman, in this particular sense where is the Rockhill Nelson? 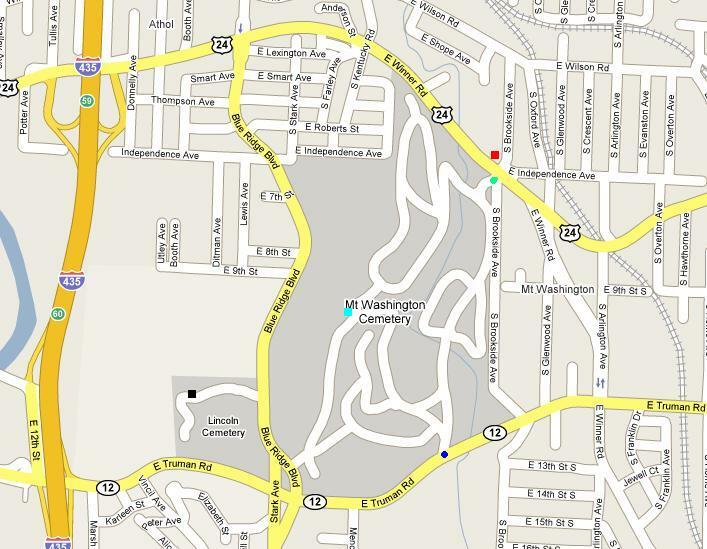 It's almost centrally located in the cemetery, both east, west, north, south. In the sense of any kind of distance, could you give us an estimate what's the total north-south distance of your cemetery in terms of mileage? Well, it's about a half a mile across to three-fourths of a mile across. Those roads are not perpendicular to one another. 24 highway and Truman Road are not perpendicular. They're different widths at different places, but it would run about three-fourths of a mile across the cemetery. Fair to say there is not a straight road in your cemetery? You just drove on after seeing this young lady at the Nelson; is that correct? Did you later see her at the front gate? Did you see her later on in the cemetery at all? That evening about 9 o'clock I saw her. That evening where was she when you saw her then? No. She was standing outside of an automobile with a male. And you had seen the car prior to being in that location; is that correct? Did you see her driving through? I had seen the lights of the car driving through on an upper road. And when you saw that car driving through the cemetery, was your response just to kind of follow it? And when you finally caught up with it it was at the Nelson; is that correct? It was at the Nelson. When you drove up behind that car, did you do anything? Was it the same young lady you had seen sitting there by herself earlier? Did you flick your lights on and off? No. I just sat there, and they got back in the car. Did you drive up close enough so that they knew you were there? I was right behind the car, because I wanted them to get out. Did they do what you wanted? They did. They understood what I was wanting. You didn't communicate with them at all? When they got back in the car, can you tell the jury what did that car do? Well, it left. It drove on to the north and out the gate at 24 Highway and Brookside. Did it drive at any unusual speeds? Would it be fair to say it just drove normally? And when it got -- when it left and went to the gate, that was at 24 Highway, right? Now, there are two gate entrances to the cemetery; is that correct? One is at the north side on 24; is that right? And one is on the south side at Truman; is that right? When you saw the car, I'm going to ask you if you would look at what we have marked and previously introduced as Exhibit Number 8. Exhibit Number 8 is a photograph. Does this car look familiar? Can you say with great certainty that this is the car that you saw that evening? Well, the color, it's a two-door. I did take the license number down. I wrote it down, that's correct. And even though it really wasn't doing anything all that suspicious, other than being there late; is that correct? That's -- well, I did that so that, if I had any vandalism or any problems the next day, I would have somebody to start with. Very good. Now, you went on home that night; is that correct? The next morning you show up, and you start opening up your cemetery gates; is that correct? When you went to open up your gates, did you have contact with a man? Later on did you learn that that was Anastasia WitbolsFeugen's father? That's how he introduced himself? Did he tell you what he was doing there? He told me he was looking for his daughter, that she had not come home that evening. Did he show you a photograph? I'm going to show you what we have marked previously and introduced as Exhibit Number 14. This is more of an 8 by 10, but is this familiar to you at all? And how is this familiar to you? The face, the shape of it, the face and her hair. Did you recognize this picture as the woman that you had seen on the day earlier in your cemetery? Now, that was the very next morning that you ran into her father, and he showed you this photograph; is that correct? Later that morning did you have occasion to go up to the area of Lincoln Cemetery? Did you have occasion to go up to the Lincoln Cemetery area? Well, one of my -- or my assistant knew the experiences I had the evening before. I mentioned to him at 8 o'clock when we opened up, and at about 9 o'clock he came and told me that he had his car radio on and heard a news report. And he said it sounds strange. He said, "I wonder if it has anything to do with what you saw last night." He said, "I think you ought to go up there." And I said, "Okay." So I went on up to Lincoln Cemetery. When you went on up there, did you have contact with the deputies that were working up there? I went up to a car that was securing the gate, and he got out, and I told him what I had seen and what I knew. And then he called the officer down in the cemetery, and he came out, and I had -- the father had given me his name and phone number. So I gave that to the officer, and I described the girl that I had seen and that was it. Did you tell him that you had written down the license number of the car? At some point. I don't remember whether I did it at that point or a later time. I probably gave it to him that morning. So where you had written it down, you either gave it to him that morning or at a later occasion when he contacted you? When he interviewed me, correct. And you gave him the number. And you gave him the name of the victim that you thought might be the victim; is that right? And you gave the father's name? And the phone number to reach the father; is that right? -- at that early hour at the cemetery. Thank you, sir. I have no further questions, Judge. Mr. Colliver, what time of evening do you close the gates and shut down Mount Washington Cemetery? All right. Is it fair to say, when you closed that last gate, there is no set time of day that you always close that gate? It's dark or dust when you shut gown and lock that gate? So, depending on the time of year, you're locking that north gate whenever the sun goes down, whenever it goes down? After daylight saving time is off, we normally close it at the 5 o'clock hour. Definitely pretty dark by that time. On this particular evening, when you followed the small car at the Nelson Memorial there, you have a recollection that it was around dusk or do you have a recollection when that would have been? It was between 15 till 9 and 9 o'clock, because I know the hour I -- the time I left my house. And I'm only about five minutes away from the cemetery to my house. When you were interviewed at the time, is it possible you said that that incident happened around 7 o'clock p.m.? All right. That was a mistake by the cops? Probably delayed. It was probably closer to 9 or a little after, because of coming in contact with the car and following it probably delayed my leaving the cemetery. All right. And, if the officer wrote down 7 p.m. that was a mistake by the officer? Do you know what time nightfall was that date, October 22nd 1997? I don't know. That's just shortly before daylight-saving time goes off. I think it goes off the last Sunday or the first Sunday of November. It was still on daylight-saving time, so it was a little bit lighter at that time. Daylight saving would have still been in effect? Mr. Lance was referring to an officer's report. We have showed you that officer's report previously; is that correct? And the time that the officer wrote down when he wrote the report back in '97, he wrote 1900, which is military time, right? You're an old military man, right? I'm military, but I didn't use the time fluently. But you knew what they were referring to? That would have been 7 o'clock, but I know it was 9 because I left my house at my wife's instructions because we watch a television show at 9 o'clock. And she said, if you plan on watching that television show, it's a quarter till 9, you'd better get home. So that's why I had the time in my mind, because I know I left the house with ample time to go down, take care of the task and get back. All right then. I have no further questions. All right. Thank you, sir, very much for your testimony.